Taurus USA is getting into the Cowboy Action market in a big way. After the successful introduction of their Gaucho single action revolver a few months ago, they are following up with their Thunderbolt, which is a replica of the old Colt Lightning pump-action rifle. I first saw a prototype of the Thunderbolt at the 2005 SHOT Show, and have been waiting somewhat impatiently ever since to get my hands on a production gun for review. Finally, the guns are in full production and are shipping to distributors and appearing on dealer’s shelves. The one sent to me is chambered for the .45 Colt cartridge, and the rifle is also chambered currently for the .357 magnum, with perhaps .44 WCF and others to follow later. 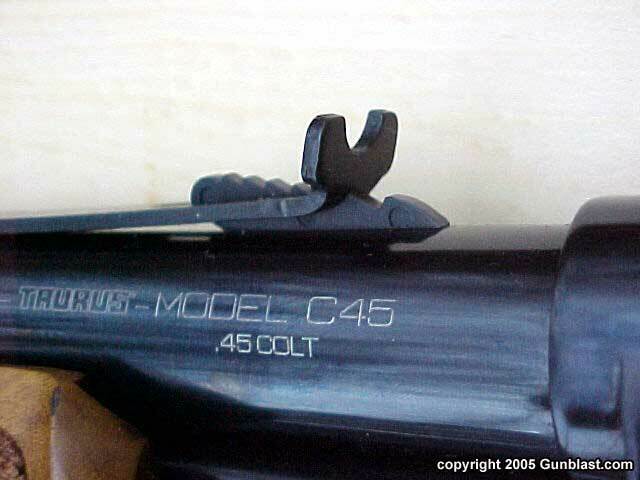 Like the original Colt, the Taurus is a short-stroke pump gun that feeds from a tubular magazine that rides beneath the barrel. 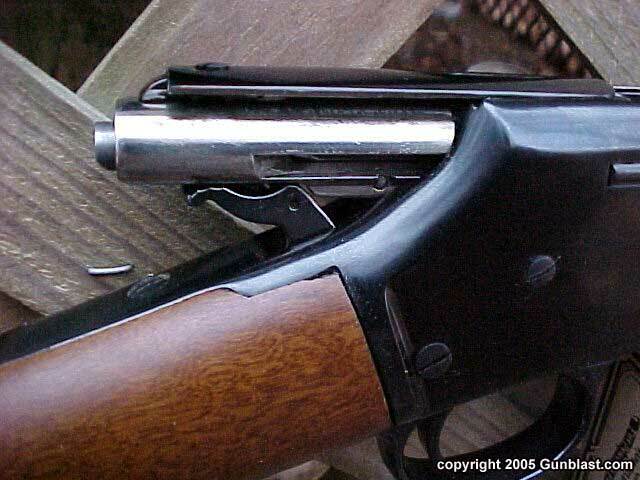 Loading the magazine is through a loading gate on the right side of the receiver, and the .45 Colt version holds fourteen cartridges. With one in the chamber, that gives a total capacity of fifteen of the fat forty-fives. 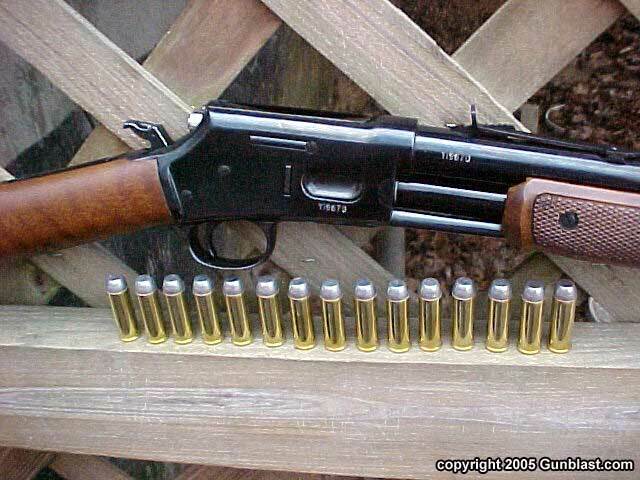 The action must be opened to load the magazine. 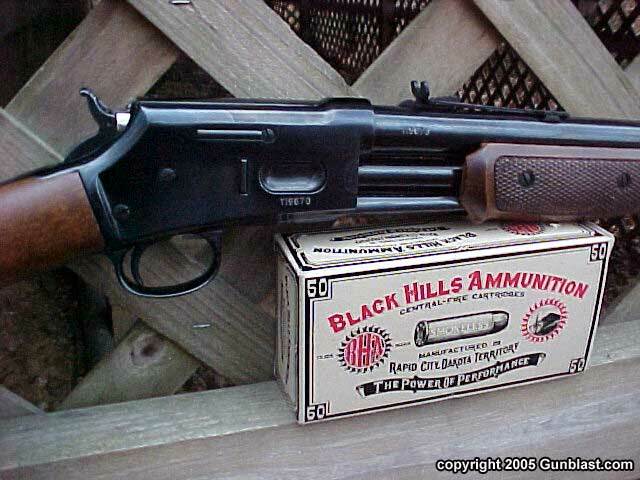 In practice, I loaded the magazine fully, inserted a round into the chamber, closed the action, and then lowered the hammer, leaving the rifle ready to fire by simply cocking the hammer with my thumb. The Thunderbolt has a button atop the hammer that allows the hammer to be lowered to the safety notch without having to touch the trigger. The Thunderbolt also has the Taurus Security System lock, which is activated by a key inserted into the back of the hammer. It is unobtrusive and easily ignored, if the owner so chooses, but is there to use if the owner desires. 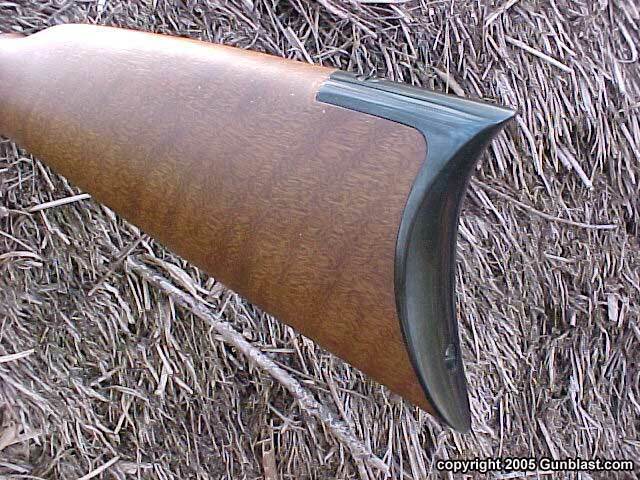 The sample rifle has a handsome wood buttstock and forearm, with checkering on the latter. The bluing is a deep black, with the metal well-polished. The fit and finish on the rifle are excellent. 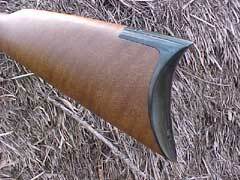 The buttstock wears a very good-looking curved steel buttplate. The front sight is drift adjustable, and the rear is also drift adjustable and elevation adjustable using the step ladder system. The rear sight notch on the sample rifle is miniscule, but I like it that way. It leaves the shooter the opportunity to fashion the notch to his own desires. I like a good square notch, but many prefer a shallow "V" style. Either can be quickly fashioned with a needle file, or the shooter may choose to use the sight as-is. 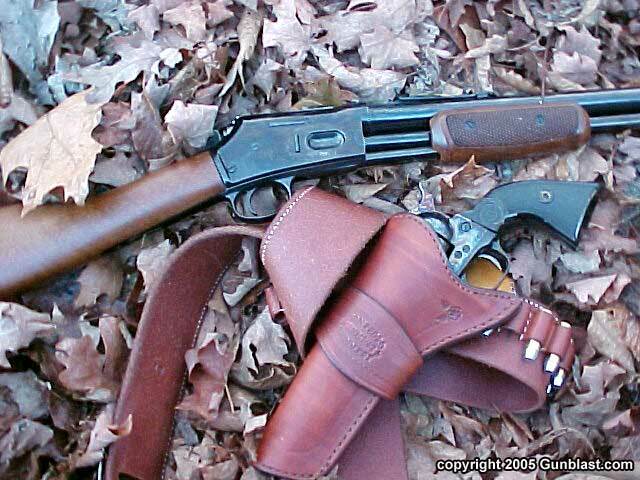 The trim barrel measures twenty-six inches long, and is just over five-eighths of an inch diameter at the muzzle. The Taurus website lists the weight of the Thunderbolt at 130 ounces (eight and one-eighth pounds), but that is incorrect. The .45 Colt Thunderbolt weighs in at six pounds and thirteen ounces, and balances just ahead of the trim little receiver, which is just over one inch wide. Overall length is forty-three inches. I really like the way that the Thunderbolt handles. It feels to me even lighter than it is, due to its excellent balance. With the weight bias towards the muzzle, it also swings on target easily, and hangs very well. It is an easy rifle to shoot, and recoil is minimal. 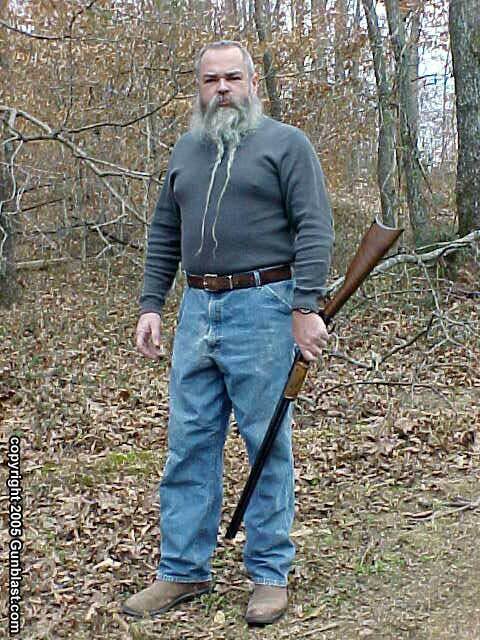 I shot the Thunderbolt with a variety of ammunition, from light Black Hills Cowboy loads, to handloads using 200 grain .45 ACP wadcutters, 250 grain Keith semi-cutters, and jacketed hollowpoints. 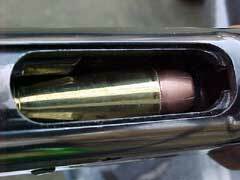 I also shot some Cor-Bon high performance 200 grain hollowpoint ammo through the rifle. The Thunderbolt handled them all very well, but the cartridge overall length is critical. Normal .45 Colt ammo worked very well, but blunt heavyweight stuff that was longer than normal tried to hang up. This was no fault of the rifle, as it was not designed to handle such ammo. 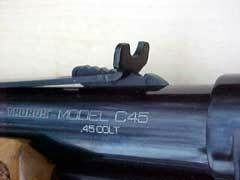 It was just an attempt to test the limits of cartridge length in this rifle. 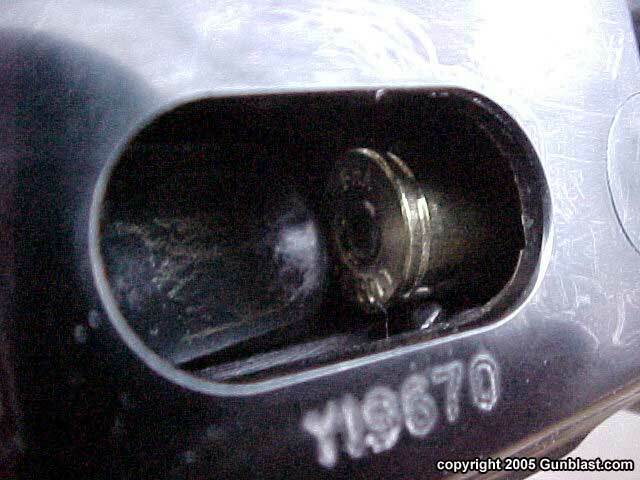 All of the normal .45 Colt ammo functioned perfectly, including the hollowpoints and wadcutters. Accuracy was very good with all ammo tested. 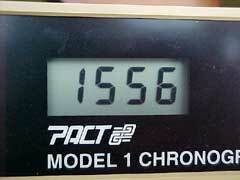 Cowboy type loads grouped within two inches at twenty-five yards; plenty accurate for Cowboy Action Shooting. 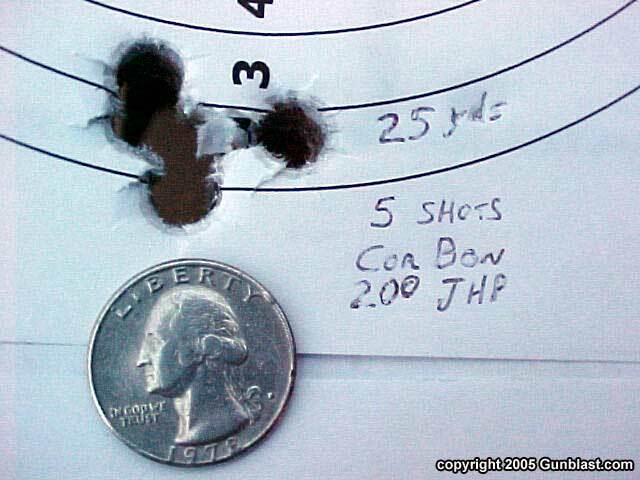 Cor-Bon 200 grain jacketed hollowpoint ammo was very accurate in the Thunderbolt, grouping into five-eighths of an inch at twenty-five yards, all day long. 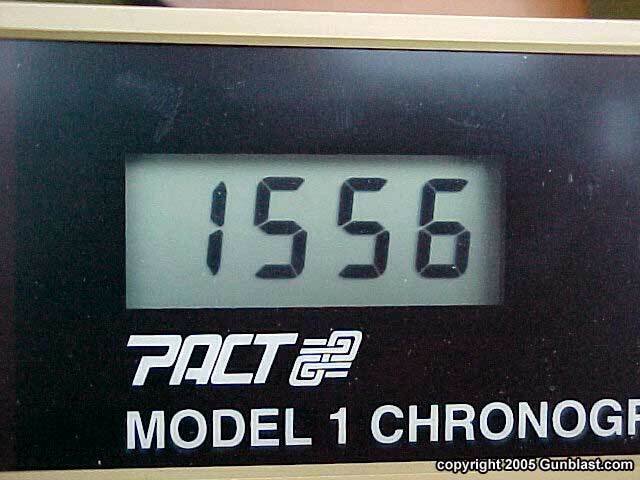 It also turned in an impressive chronograph reading of 1556 feet-per-second from the rifle. This is standard pressure ammunition, advertised at 1100 feet per second from a revolver. I intend to try this load on whitetail deer before the season ends this year. It should work very well. The groups shot with the Thunderbolt were using the unaltered open sights. I am certain that I could make it group even better with a little alteration to the rear sight, to allow my aging eyes to better align the sights with the target. The Taurus is easy to shoot quickly and accurately. 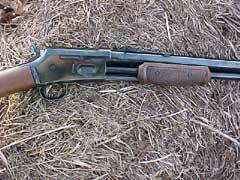 It is a fun gun; a big bore plinker, but it is also much more than that. It should be a dandy deer rifle for ranges out to about 100 yards, which is my self-imposed limit for shooting at game with open sights. Others may do better, but for me, that is my limit. 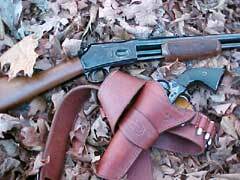 Hunting in the woods, it should be just great, chambered for either the .45 Colt or the .357 Magnum. There are a couple or three replica Colt Lightings on the market now. I have fired the USFA Lightning, and it was just as accurate as the Taurus. However, the basic USFA Lightning costs over one thousand dollars more than the Thunderbolt. The USFA lists at $1480, and the Taurus currently lists for just $475. For the Cowboy Action shooters, the main competition for the Thunderbolt will be the various lever action rifles currently available. 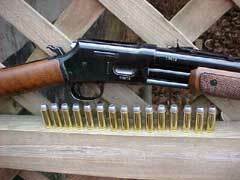 I love lever action rifles. However, for a completive shooter, the pump does offer a couple of advantages. The action stroke on the Thunderbolt is very short; only two inches, straight back and straight forward. 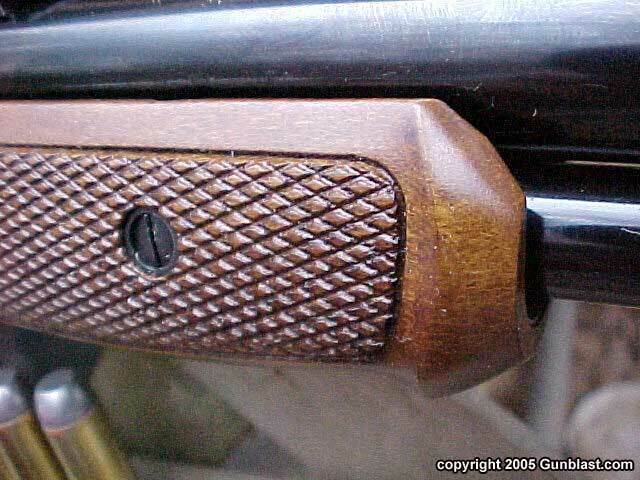 Also, the shooter’s strong hand never leaves its position on the rifle as it does with a levergun. The shooter’s trigger finger stays inside the trigger guard, and the hand never releases its grip on the rifle. Just like the original Colt, the Thunderbolt can be fired by holding the trigger and pumping the action. A shooter can very quickly empty the rifle this way. At close range, it is a lot of fun! 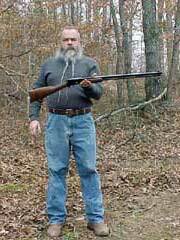 While I intend to take this rifle hunting, and it should prove very popular with the Cowboy Action crowd, the Thunderbolt is a fun gun. A Cowboy Action shooter who wants something a bit different than the other shooters are using would be well-served by the Thunderbolt, whether or not he picks up a little speed with the Taurus rifle. It would fit in very well at any Cowboy Action match. It just reeks of nostalgia. 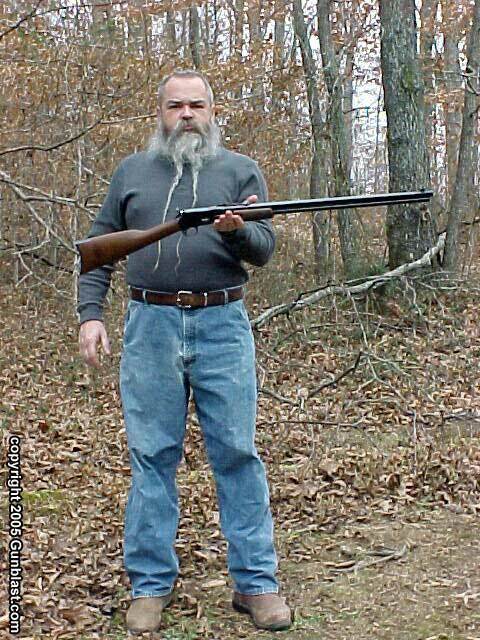 The Thunderbolt is also a solid choice for a center fire plinker, and would serve well for a pistol-caliber defense gun around the homestead, for predators of either the four-legged or two-legged variety. The Taurus Thunderbolt is well fitted, well finished, reliable, and accurate. It is a beautiful rifle that, like a good levergun, takes the shooter back into the past to an era when times were simpler but tougher, back when rifles were made of blued steel and real wood. Teamed up with a good single action revolver, like the Taurus Gaucho .45 Colt pictured to the right, it is a highly useful and fun combination, which just might be the best reason of all to own one. SASS (Single Action Shooting Society, the "governing body" of Cowboy Action Shooting) has just announced that both the Thunderbolt and Gaucho have been approved for competition. Check out the extensive line of Taurus firearms online at: www.taurususa.com. For the location of a Taurus dealer near you, click on the DEALER LOCATOR icon at: www.lipseys.com. I just received a note from Cor-Bon stating that the 200 grain JHP load is loaded to around 21,000 to 23,000 PSI, which does exceed industry specifications for the .45 Colt pressures. However, it is not loaded as heavy as many Plus P loads, and is safe to use in the Taurus, as well as newer Single Action Army type revolvers. Taurus' Thunderbolt rifle and Gaucho sixgun, both in .45 Colt - a fine common-caliber pair for the hunter, plinker or Cowboy Action shooter. Author likes the balance and light weight of the easy-handling Taurus Thunderbolt. 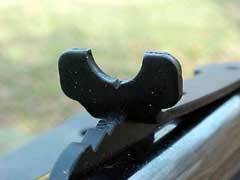 Authentically-styled iron sights are well-executed and easy to use. 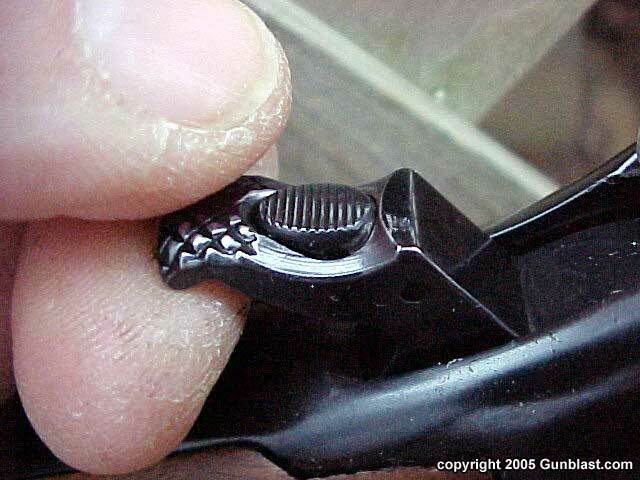 Thumb release allows the hammer to be safely lowered without pulling the trigger. 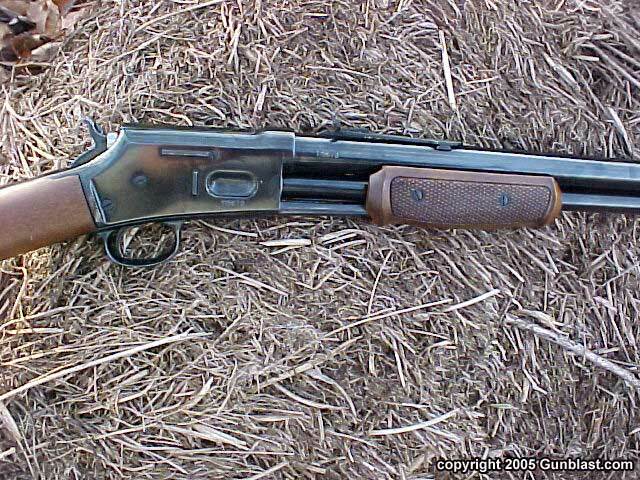 Fully loaded, the Thunderbolt carries fifteen rounds of .45 Colt firepower. 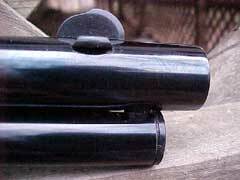 The Thunderbolt features a checkered forend (top) and nicely-figured buttstock with crescent steel buttplate (bottom). Cartridges are loaded into the magazine tube via a loading gate in the side of the receiver. Standard-length .45 Colt cartridges feed smoothly and reliably. The Thunderbolt is plenty accurate with good ammunition such as Cor-Bon's 200-grain JHP load (top). 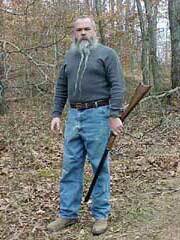 5/8" 25-yard group is about the author's limit with iron sights. Bottom picture shows that Cor-Bon's standard-pressure 200-grain JHP picks up a great deal of power when fired in the longer rifle barrel.